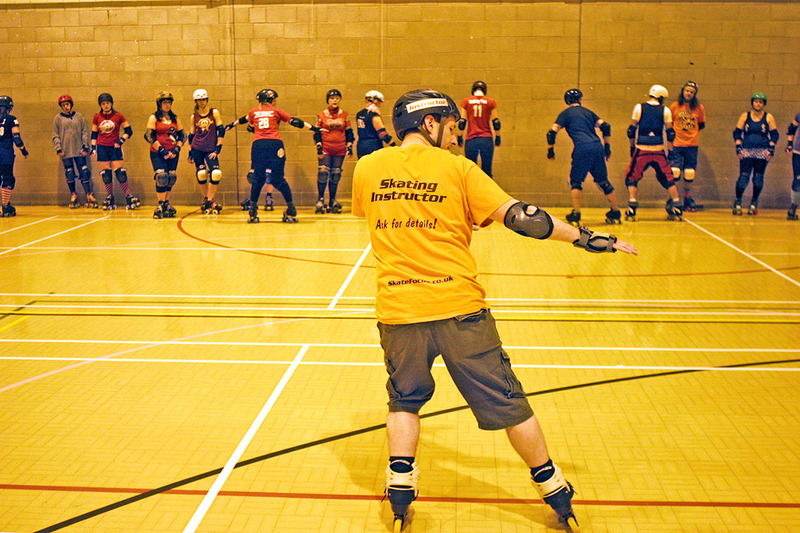 The story of modern roller derby is a huge success story with it being touted as one of the fastest growing sports today taking on new skaters at an amazing rate. 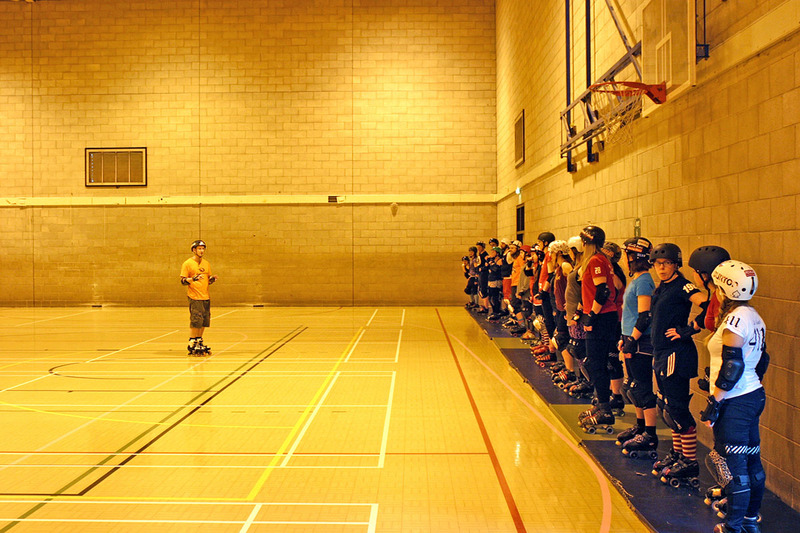 In Leicester we are lucky to have a very friendly and successful roller derby team called the Dolly Rockit Rollers who have over 60 players. They wanted a bit of extra help with backwards skating and I was invited to one of their training sessions by Eve, their head coach last Sunday. They have use of one of the largest sports halls in the city for 3 hours each week which was recently resurfaced with 2 full roller derby tracks permanently painted on the floor. It was simply fantastic to skate on. There are several “textbook” ways to skate backwards and I was instructed by Eve to teach the backwards half-swizzle method (backwards half lemons) which is a Level 2 intermediate skill on the ICP skill list (http://www.inlinecertificationprogram.org/). The reason this method was chosen was because both the player’s feet stay on the floor at all times allowing them to receive a hit from another player with more resilience. I was told there would be about 20 skaters in the lesson and I was given an hour to do it. Although this was tight I had to be flexible and adapt my lesson plan to accommodate. We started off going over some one foot skating skills and making sure everyone was confident supporting their bodyweight on one leg while performing a pushing action with the other – on both sides. Luckily the sports hall had some crash mats which are a great indoor alternative to grass as a high friction surface on which to perform static exercises on skates, so we practiced this first stationary and then rolling forwards. I then asked people to pair up and do the same thing while performing backwards half lemons with the support of their partners which everyone seemed to enjoy and helped them build confidence. After several exercises on both sides we started to move towards backwards skating individually covering how to start from a standstill and how to comfortably look in the direction of travel. After everyone had practiced skating backwards on their own we had a backwards relay race which was designed to mimic what people might find in the new roller derby minimum skills test and allow people to try out then new skills in a fun way. This went down very well and it’s safe to say roller derby players are very motivated when it comes to winning! We finished just in time and everyone had a great time exploring a new backwards skating skill. What had been a source of anxiety for some had now been broken down and understood. Even the people who were experienced skaters and could already skate backwards enjoyed the way skills were broken down into easy, manageable chunks and the often overlooked body mechanics that go on behind-the-scenes were explored. 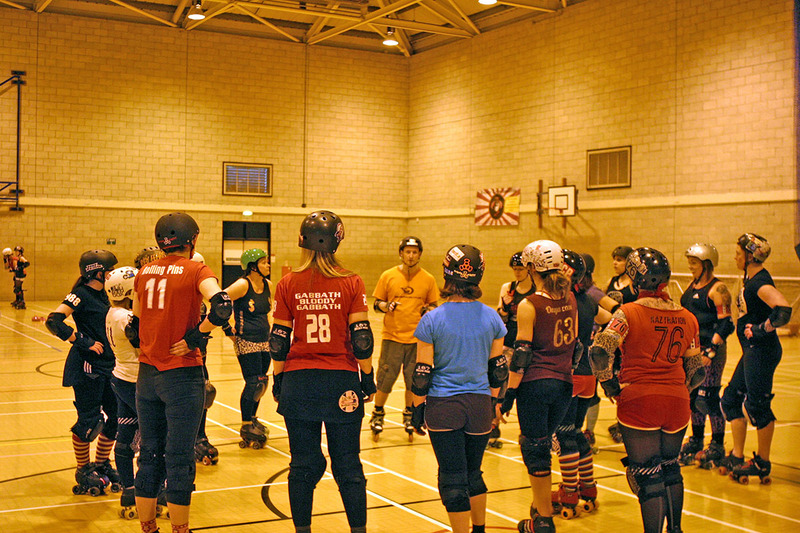 The Dolly Rockit Rollers are a great bunch of people and it was good fun doing the lesson for them. Hopefully they will invite me back to look at other essential backward skating skills such as how to transition from forwards-to-backwards skating, backwards-to-forwards skating and the often troublesome backwards cross over.